While many people know how to make an apple pie, there are those that are looking for something a little over the top. Maybe it will be entered in a contest or maybe served to an important guest; apple pie can be every bit as gourmet as any five star recipe. In any food, the quality of the finished product is only as good as the quality of what goes into it. Knowing which varieties of apples will work best and which spices with add the most flavor is an important part of the success of the pie. Look for firm apples that smell fresh. Organic apples tend to have more flavor than conventional apples and if you can get them fresh from a local orchard so much the better. Another hint is that using several varieties of apples will give a pie more flavor than just one. Peel and core the apples, dropping them into a large bowl of apple juice mixed with lemon juice. This will keep the apples from turning brown. Don't worry, soaking the apples won't diminish the flavor at all. Spices don't stay fresh very long and they can lose flavor. Try to buy your spices from a specialty shop like Penzey's where they are good quality and fresh. Common spices for apple pie are cinnamon, cloves, ginger, and nutmeg. There are numerous types of cinnamon. One of the best for pie making is China Tung Hin cinnamon, which has a deep, spicy flavor and ultra sweet finish. Korintje is milder and sweet, while Vietnamese has a sharp spice. Most people are used to Ceylon cinnamon, which has the mildest flavor. Adding a unique cinnamon will add flavor and depth to your pie. Adding a pinch of cayenne pepper will give the pie some heat that goes well with the cinnamon flavor. It does not add any actual flavor so it won't change the taste, just the spiciness. The pastry you choose will make a big difference how the finished pie looks and tastes. You should use either the Pate Brisée or Pate Sucre as the bottom crust for best results. Use whatever you like for the top crust. Puff pastry adds a nice crumbly texture to the pie. Streusel is a sweet topping for a tangy apply pie. Pâte Brisée is flakey and allows the flavors in the filling to come out. Pâte Sucrée is a slightly sweet pastry. When making pastry it is important to keep everything very cold. Use well-chilled butter, have a bowl of ice water to dip your fingers in while you are working with the pastry. You want the butter to be encased in the flour without being melted into it. Using your cold fingers cut the butter into the flour until it looks crumbly. Use enough ice water to make a pliable dough. It may take a little more water than is called for in the recipe. Now, cover it carefully and let it rest in the refrigerator for thirty minutes. Place the dough on a lightly dusted countertop and roll gently. If the crust begins to warm up then chill it for a few minutes before rolling out more. Fit into the pie pan carefully. Allow the pie crust to rest a few minutes in the refrigerator before continuing with your pie. When you add the top crust brush it with one egg yolk mixed with a teaspoon of water. Sprinkle some coarse crystal sugar over the top of the crust. When the crust bakes, it will get golden brown, shiny, and have a nice texture and sweet glaze. Most pies will need to bake for 40 minutes at 400 degrees unless your recipe calls for a different temperature. No matter what the additions might be the apple pie always has a basic structure. Use this simple recipe as a starting point and then experiment. Roll out half the pie crust at a time. Line the pie pan with one half. Place the apples in a large bowl. Mix the spices, flour, salt, and sugar together and toss the apples in this mixture. Add the apples to the crust. Dot with the butter. Lay the top crust over the top and press the edges together firmly. Cut a design in the top crust to allow the steam to escape. Bake for 40 minutes in a 450 degree oven. When it is done, juice will look thick and bubble out of the top. Top pastry chefs all over the world have experimented with apple pies and come up with some interesting variations. Be willing to do the same with different combinations until you get it just right. 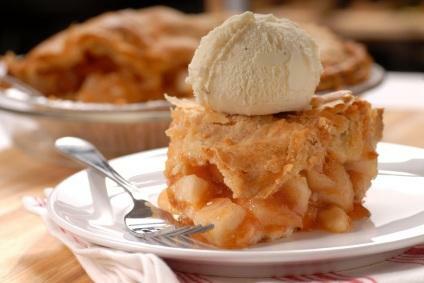 Knowing how to make apple pie allows you to make a delicious dessert that almost everyone loves.